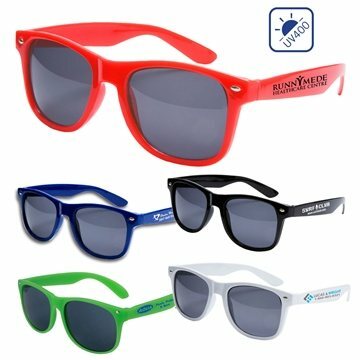 Adult Sized Sunglasses With High Gloss,Extra-Strong Polycarbonate Frames and FDA Compliant Polycarbonate lenses. They come with matching colored frames and arm. Material: Polycarbonate Frames & Lens. Order processed quickly, with no problems. Received quickly and in great condition. I'll recommend them and employ the corporation again. The quality is good for the price. Would buy again and highly recommend product and company. The imprint of our company logo is great and the size was increased due to your Sales director Alicia's diligent customer service to satisfy and guarantee the best efforts of my requests. the imprinted logo looked great!